What do you get for the person who has everything? 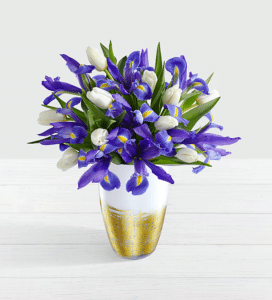 Maybe you’re looking for a cheerful way to brighten the day of a loved one who lives far away. Or perhaps you’d just like to add a festive floral touch to your own home or office. Whatever the case, you can’t go wrong with a lovely Christmas flower arrangement. The most popular Christmas flowers include amaryllis, white lilies, poinsettias, and white or red roses. But at this time of year, our favorite florist is offering so much more than just standard bouquets. Christmas trees and wreaths are common choices for the season, and of course you’ll need a centerpiece for the dinner table. You’ll find many arrangements add in fun and festive decorations like candles, candy canes, cinnamon sticks, holly, ornaments, and pinecones. Too many choices to pick from? Don’t worry. We’ve chosen a selection of 25 beautiful floral options that are sure to spark the holiday spirit in even the grouchiest Scrooge! The Candy Cane Glory Bouquet from Send Flowers is a great choice for anyone with a sweet tooth or a playful sense of whimsy. Bright red carnations are mixed with white lilies and white chrysanthemums. 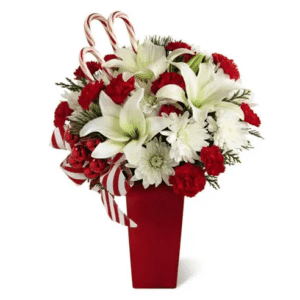 Then the whole bouquet is nicely accented with the perfect red vase, three candy canes, and a red and white candy striped ribbon as a finishing touch. For a holiday bouquet with a touch of luxury and more than a hint of romance, try the Christmas Magic Bouquet from FTD. 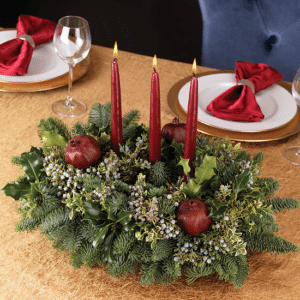 bright red roses, carnations, and berries are arranged among beautiful Christmas greens. 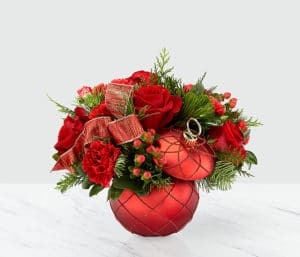 The bouquet is then presented inside a festive sparkling red ceramic ornament, which makes a delightful keepsake. Bonus – find FTD coupons on our site before you shop. Dark and luxe, this Christmas Morning Bouquet from Calyx Flowers is a lovely way to add a touch of romance and mystery to your Christmas decor. A base of white hydrangea is crowned with red roses and hypericum berries, then accented with red painted solidago and pine greens. It’s all the colors of the holiday season displayed in a lovely dramatic bouquet! 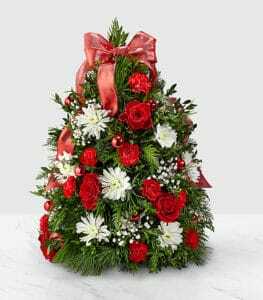 Teleflora’s Festive Pines Bouquet is a rush of festive color in a delightful arrangement for the season. Big red and cream roses and white snapdragons are on display among seeded eucalyptus, lemon leaves, cedar, and white pine greens. They’re ready for display in a clear glass cylindrical vase, then topped off with frosted pinecones and fun Christmas candy canes. It’s like a Christmas party in a vase! If you’re dreaming of a tropical Christmas, let this Festive Protea Palm bouquet from ProFlowers brighten your season. A dark pink oriental lily and two hot pink matsumoto asters are combined with red hypericum, orange pincushion protea, burgundy cotinus, pink kalanchoe, burgundy feather celosia, and green palm leaves for a bright pop of color even in the dead of winter. Display your bouquet in their faux birch vase or choose the gold brushed vase to add a metallic gleam to this stunning and bright arrangement. A beautiful and delicate bouquet, Let It Snow from Teleflora may be just the perfect arrangement for Christmas. 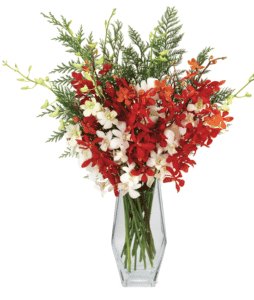 Snow white alstroemeria and lovely red blooms are mixed together with pinecones and bright red berries. The arrangement is then displayed in a crystal clear glass bowl and tied off with a red ribbon. It’s the sort of arrangement that will look delightful perched on an end table in the living room, or just about anywhere else in the house you might choose to place it. The bright colors of this beautiful bouquet are sure to cheer up even the dreariest winter. Merry Christmas Orchids from Calyx Flowers is a lovely arrangement of ruby red mokaras and creamy white dendrobiums. 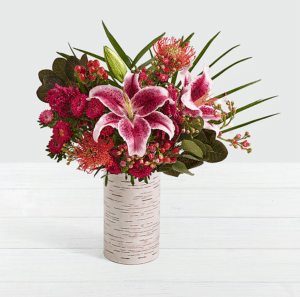 These exotic blooms are then accented with fragrant natural cedar and showcased in a trapezoid-shaped glass vase for a festive look you’re sure to love. If you’re looking to send a little whimsy to a family or a child this Christmas, Santa Paws from 1800flowers is an adorable option. 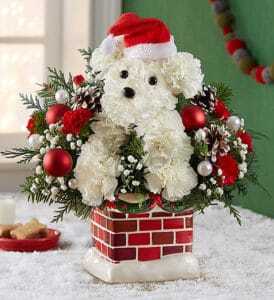 White carnations are crafted into the shape of a dog, adorned with its own mini Santa hat. It’s then surrounded by red mini carnations, baby’s breath, Christmas greenery, mini pinecones, and mini ornaments. The arrangement comes in a ceramic chimney container and includes a lovely keepsake ornament of Santa in his sleigh. If you’d prefer a holiday bouquet featuring cooler colors, Winter Blooms from ProFlowers could be the perfect bouquet for you. 10 blue iris are complemented by 10 white tulips. We recommend the gold brushed vase to add a bit of holiday bling to this lovely arrangement. 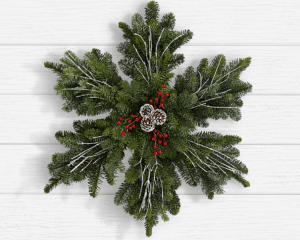 Circular wreaths are lovely and traditional, but if you’d like one with a bit of dramatic flair, you’re sure to enjoy the 24″ Evergreen Snowflake Wreath from ProFlowers. Crafted by hand from noble fir, this beautiful wreath is accented with white painted pine cones, red faux berries, and glittery white branches. It’s a winter wonderland that you can enjoy on your door no matter the weather! 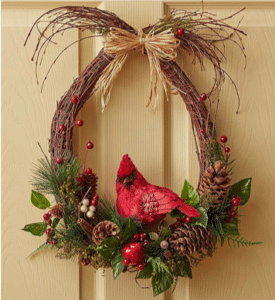 Welcome guests to your front door with the 18″ Jingle all the Way Wreath from ProFlowers. Their preserved greens in this lovely wreath are a combination of cedar, silver dollar leaves, and red phalaris. And sprinkled throughout the wreath are several pairs of shiny silver sleigh bells that will jingle out a greeting each time you open the door. If you’re looking for a wreath that’s both traditional and unique, the Woodland Cardinal Wreath from 1-800 Flowers is the perfect option for your Christmas display. 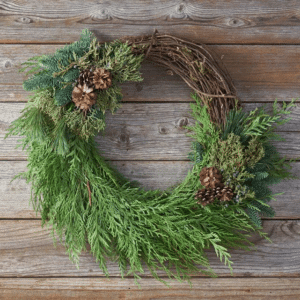 The tear-shaped wreath is handcrafted from natural twigs, then adorned with pinecones and faux greens. A delightfully whimsical cardinal is then perched in the center and the whole thing is then topped off with a natural raffia bow. If well cared-for, it will last for several annual displays. 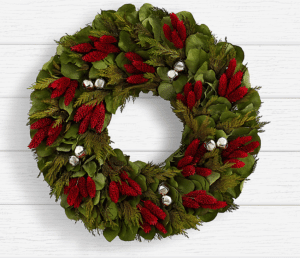 The Warmth wreath from The Bouqs is a lovely rustic country style wreath for a traditional or down-home Christmas celebration. The braided grapevine and pine wreath is woven with evergreens and accented with pinecones. It’s a natural look that can be displayed as is, or you can add a bow or lights of your choosing. The Dove and Peace Spruce Tree from ProFlowers is a vision in green, gold, and white. 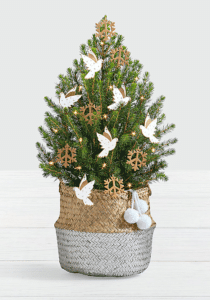 This fresh from the farm miniature spruce tree comes with white and gold doves, gold peace sign snowflakes, and six feet of tiny LED twinkle lights. It’s planted in a lovely silver and gold painted basket adorned with white snowball pompoms. And best of all, this can be a Christmas memory that lasts for years to come, and can even be planted outdoors after the season is over. 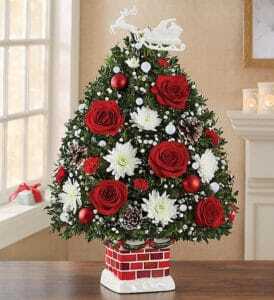 For a traditional floral Christmas tree, it’s hard to find better than the Make it Merry Tree from FTD. Nestled among the greens are red roses, white pompons, and red mini carnations. The lovely tree is then topped off with a red organza bow. Include an additional gift like a teddy bear or some delicious chocolates, and whisk the whole package off to the recipient of your choice. The Night Before Christmas Holiday Flower Tree from 1-800 Flowers is actually a flower arrangement in the shape of a Christmas tree. It features red roses and mini carnations, white cushion poms, Christmas greenery, and baby’s breath. It’s then tucked into a ceramic chimney container and decorated with frosted pinecones, pearl garland, and Christmas ball ornaments. And once the season has passed, you’ll still have a white frosted Santa Claus keepsake ornament to display on your tree for years to come. Are you someone who prefers to decorate for Christmas in shades of blue and white? This Rockin’ Blue Mini Christmas Tree from Send Flowers may be just the perfect addition. 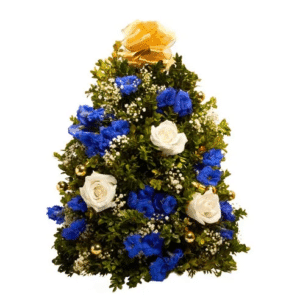 The mini tree is delightfully adorned with white roses, dark blue delphinium, tiny white flowers, and gold tree ornaments. Then the whole thing is topped with a bright golden bow! For the green thumb on your Christmas gift list, the Holiday Homecoming Basket from Teleflora offers four beautiful plants in one. A red poinsettia and white cyclamen are offset nicely by green pothos and variegated dieffenbachia. All four arrive arranged in a lovely wicker basket adorned with a plaid organza bow. The beautiful blooms and lush greens are perfect for displaying all season long! The Holiday Miracle Garden from Calyx Flowers is an oasis of tropical blooms in the midst of a wintery season. 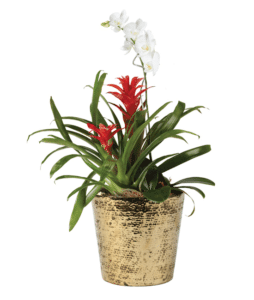 A lovely red bromeliad and a bright white orchid are planted in a beautiful golden ceramic pot. 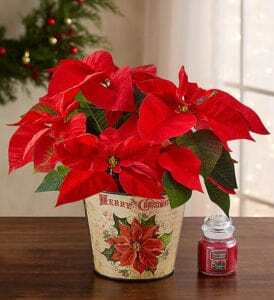 With proper care, this plant is sure to be a beautiful reminder of holiday joy for months to come. Possibly the most iconic flower of Christmas, a poinsettia with its brilliant red and green hues is a standard for many households. The Holiday Traditions Poinsettia from 1-800 flowers delivers a beautiful blooming plant in a metal planter with vintage-inspired artwork. As a bonus, you’ll also get a small scented candle to help spread some Christmas cheer! Another common Christmastime bloom is the amaryllis. 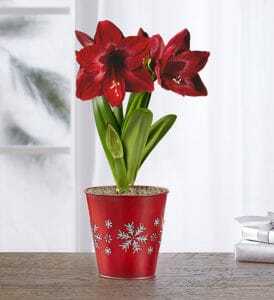 The Shimmering Snowflake Amaryllis with free candle from 1-800 Flowers arrives rooted and sprouted so you can watch it bloom before your very eyes. Keep it indoors in its snowflake container through the holidays, then plant it outdoors to enjoy it in the warmer months. You’ll also receive an evergreen scented candle to add the scent of pine to your holiday hearth. If you’re looking for a table centerpiece that’s rich and full, and space on your table isn’t at a premium, we love this Candlelit Flower Centerpiece from Send Flowers. 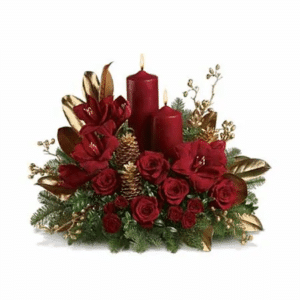 Two festive red pillar candles are surrounded by red roses, carnations, and amaryllis. The beautiful and rich dark red hues are then nicely complimented by holiday greenery accented with golden leaves, berries, and pinecones. If you’re looking for a centerpiece with symbolism and tradition, the Fresh Pomegranate Centerpiece from Calyx Flowers will certainly fit the bill. Three tall and straight red taper candles are tucked into a bed of evergreens and holly, Tradition dictates that pomegranates are a symbol of good luck and good fortune, so the three nestled into this arrangement are a lovely way to wish someone a prosperous year to come. 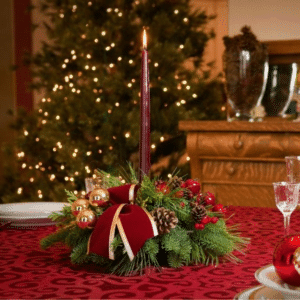 If you’re planning an elegant and refined Christmas dinner, the Royal Christmas Centerpiece from Teleflora will be an excellent accent for your table. The arrangement features white alstroemeria and creamy roses nestled among holiday greens including holly, cedar, fir, and pine. It’s then decorated with golden pinecones, gold ribbons, and a wealth of ornaments and golden berries. The look is topped off with three metallic gold taper candles to light your holiday table in style. For a small kitchen table or one where you don’t have a lot of extra space, the Small Holiday Centerpiece from Lynch Creek Farms will be a perfect fit. At just 15” across, this arrangement of evergreens is adorned with pine cones, berry clusters, apple clusters, and gold ball ornaments. It’s then topped with a burgundy velveteen and gold bow and a burgundy taper candle standing tall. If you prefer, red and plaid options are also available. If you’ve decided to create your own bouquet, you’ll love our articles about red flowers and white flowers. From all of us at Crafts Glossary, we hope you have a wonderful Christmas this year and every year!